A tiny dog, a kindhearted girl, and a nervous juggler converge in a cinematic book in four acts — a unique children’s literature experience. Lucy is a small dog without a home. She had one once, but she remembers it only in her dreams. Eleanor is a little girl who looks forward to feeding the stray dog that appears faithfully beneath her window each day. Eleanor’s father is a juggler with stage fright. The overlapping stories of three delightful characters, offering a slightly different perspective each time, come together in a truly original, beautifully illustrated book for dog (and underdog) lovers of all ages. Randy Cecil has illustrated more than twenty books for children, including Brontorina by James Howe, And Here’s to You! by David Elliott, and Lovabye Dragon by Barbara Joosse. He is also the author-illustrator of Duck and Gator. Randy Cecil lives in Houston. Each character's daytime decisions lead to new outcomes after their paths intersect for a show-stopping evening performance during a climactic third act...Children ready to move beyond early readers will appreciate the pace of the page turns and the chance to discover visual details that characters miss.A brief denouement in the final act reveals that each main character has given the others just what they needed; a clever structure and a satisfying story. Cecil’s stylized black-and-white oil paintings are framed in circles, focusing each scene as if through a lens. The conclusion unfolds naturally, while Cecil’s understated writing and careful pacing contribute substantially to this sweetly satisfying story. All acts but the fourth end with a nightmare: Eleanor's father paralyzed with stage fright as he tries to juggle on stage at the Palace Theater. In the satisfying denouement, dog, girl and father all find what they seek, be it sausage, love or courage. Cecil's circular duotone illustrations have the pleasingly odd, architectural starkness of Edward Gorey's compositions, but with the soft texture of sandstone. Lucy is a sweet stray dog story and an extraordinary exploration of persistence and perspective. 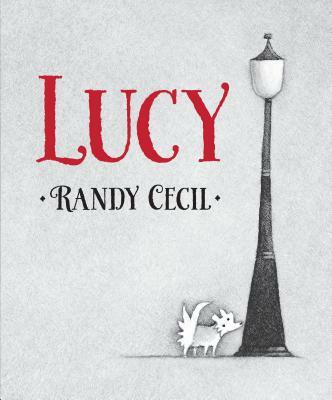 Randy Cecil's Lucy offers a heartfelt reminder that the picture book form can remain relevant and even necessary after the preschool years...The story, too, is full of charming details for careful readers and listeners. Cecil uses repetition to tell his story, but the repetitions are full of tiny tweaks and twists that keep readers guessing (and sometimes giggling) and propel the story to its cozy; satisfying end. There’s an early cinema flavor to this period charmer that eventually grants the wishes of the Wisches (and their new dog); each page could almost be a captioned silent movie scene as the tightly structured and neatly intertwined plot unfurls...The carefully repetitive text will also make this an engaging readaloud, but be sure to keep your audience close to see the show unfold in the art. This quiet, satisfying tale with its old-fashioned setting is sure to enthrall readers of many ages as they reexamine the detailed illustrations. Best for one-on-one and small group sharing. The sweet coincidence of a hopeful dog, a resourceful girl and an anxious juggler plays out in the pages of “Lucy," a light and delicious illustrated tale for 5- to 8-year-olds...This elegant book is so infused with serendipity that what’s really a foregone conclusion nonetheless feels, at the end, like a happy surprise. Bloomville is a place many readers will be happy to have visited—and wish to revisit again. It’s [a] kinder, gentler, altogether more charming world than our own, and its citizens will entertain. The lovely interplay of words and art contributes to a unique package — dear and droll, steady and sure, classic and cinematic. Delightful, gentle and clever in both text and marvelous black-and-white illustrations on every page, "Lucy" is a special book on multiple levels. Lucy is unlike any other picture book you’ll see this year. A breath of fresh air.